Veteran trainer/broadcaster, Teddy Atlas, has weighed in on the issue of ‘Canelo’ Alvarez insisting Gennady Golovkin must come to 155 for any future middleweight fight, suggesting that even if it’s technically wrong, the Mexican’s greater star power means he can essentially call the shots regardless. Alvarez must first come past WBC champion, Miguel Cotto, in next month’s Mexico/Puerto Rico mega fight before any Golovkin fight is even considered, although should he do that and inherit the Kazakh WBA/IBF champion as his mandatory challenger, Atlas shares the opinion of many realists that in this money driven sport, Canelo’s proven box office record may well end up dictating the terms of any potential fight. Alvarez’s last fight in May – a non-title affair against James Kirkland, the week after the Mayweather/Pacquiao disappointment, generated roughly 2.1 million viewers, the highest rated HBO fight since 2006. Conversely, Golovkin’s (PPV) debut on the broadcasting giant, against David Lemieux earlier this month in a middleweight unification, just pushed past the 150k mark, despite all the pre-fight hype and selling out Madison Square Garden. His last [non-PPV] fight with Willie Monroe in May, hit the 1.3m viewer mark. “[Canelo] makes money. He’s got a great audience, a great, great Latino audience, the greatest boxing audience in the world. He has that power,” Atlas said to ESNews. 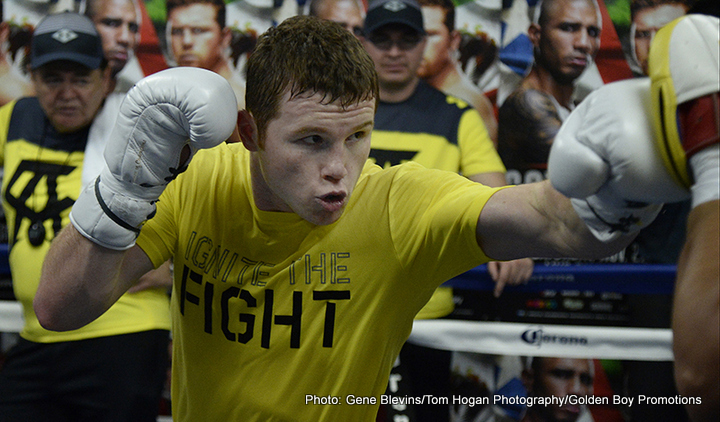 “Canelo has that audience, he has that power. He can do good PPV numbers and because of that (power) he can demand that because Golovkin can’t make big money. Golovkin can make good money, decent money, but not big money. “If Golovkin wants to [generate more buys and money] he has got to probably do that with someone like Canelo who’s more known and more popular than him. I get it. If [Canelo} can demand  and get away with that, I get it. When you consider Cotto’s last fight against Daniel Geale generated in excess of 1.5m buys on HBO, regardless of if Golovkin/Lemieux suffered a scheduling clash with baseball and college (American) football, hopes of a Golovkin fight with the winner of Cotto/Canelo are slim at best if neither will budge from a catch weight. There is a clear popularity divide. Cotto is as equally insistent on one as Canelo and as Golovkin [righty] refuses to contest middleweight fights below the 160 lb limit, expectations are perhaps slim for a big fight between them next year. At least one on Golovkin’s terms. The avoided Kazakh faces the tough ask of building his own PPV star, and will also return to non-PPV fights as promoters K2 continue to expand upon his burgeoning profile. All in all, it may prove to be a very big headache for the WBC….